(Chen NC, J Hand Surg 2003;28A:88). Supine position with arm table. Tourniquet placed high on arm. Incision along subcutaneous border of ulna centered over planned osteotomy site. Dissection down to ulna in the interval between the ECU, FCU. 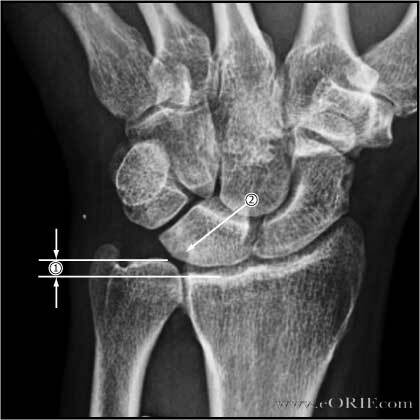 Place 6-hole LC-DCP plate over volar ulna with the distal tip @2cm from the tip of the ulnar sytoid. Mark the center of the plate using cautery or a marker. This is the osteotomy site. Circumferentially subperiosteally expose the ostetomy site. Fix the plate to the ulna with 3.5mm screws using the distal 3 holes and standard AO-technique. Mark a the ulna longitudinally centered at the osteomy site to aid in restoring rotational alignment after the osteotomy. Measure and mark out pre-operatively determined osteomy. Perform osteotomy with oscillating saw. Do not complete one of the osteotomy cuts untill the other is nearly completed. The remaining fragments become moblie after osteotomy. It is easier to make perpendicular osteotmies simultaneously. Irrigate with cool water while performing the osteotomy. Place plate using three distal screw holes previously made. Compress osteotomy site end clamp in place with reduction forceps. Varify appropriate variance has been restored fluoroscopically. Consider compressing osteotomy site with AO tensioning device. Fill remaining screw holes using AO technique. 7-10 follow-up: dressing changed, removable volar splint placed. Start OT for ROM. 6 week follow-up: check xrays. Advance therapy. Discontinue removable splint and advance to strengthening once bony union is evident. 100% union in an average of 6–8 weeks. 72% excellent, 17% good, 11% fair. 44% required plate removal for local discomfort. (Chen NC, J Hand Surg 2003;28A:88). (Chun S, J Hand Surg 1993;18A:46).